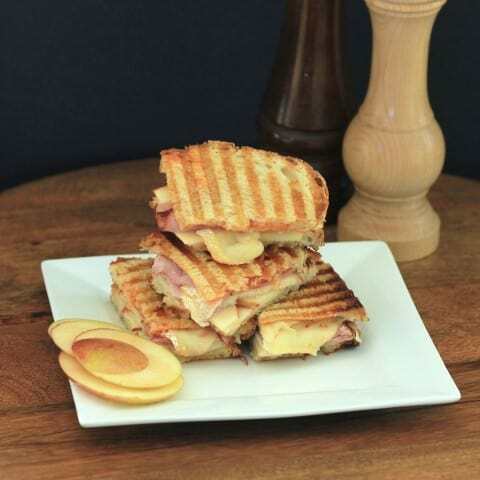 Paninis are super easy for a Weekday Supper and the flavors of brie, apple and ham together creates something memorable. Every time I go to Ontario I end up going to Springridge Farms and my girlfriend Karen gets this sandwich but without the ham as she is a vegetarian. For some reason I am always enticed to get another seasonal sandwich. The last time I was there I got the turkey and stuffing sandwich with cranberry sauce. Oh ya baby was that good!!!! Anyway I wanted to make that sandwich to share with my family as Karen has always raved about it and I see why!!! What a great combination of flavors, sweet, slightly spicy and with amazing melty brie cheese. You can’t go wrong!! Your family will gobble down this sandwich and ask for more!! Apple, Brie and Ham make a memorable combination of flavors!! Butter the outside of the bread, turn over onto a work surface and spread one slice with red pepper jelly. Top with apples, ham and brie cheese. 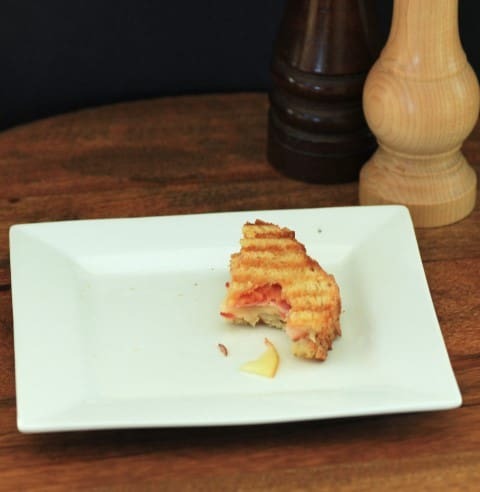 Top with the other slice of bread and toast in a panini maker until cheese is melted and the sandwich is heated through and toasted on the outside. Come and see the rest of the recipes for the week, you will love them. I was thinking of you Isabel when I decided to do this sandwich, as I know how much you love brie!! A quick run to the store for some brie and I can make this for my lunch. I don’t think I can wait to have it for supper. Yum! I hope you like it as much as we did Renee!!! Now I so very much regretting leaving my lunch at home today. This sandwich just look amazing. This looks amazing – I made mini brie appetizers for Thanksgiving and am in need of recipes for the extra cheese. This fits the bill! I love brie period and could have it any day!! Thanks for coming over!! It’s close to dinnertime and this post is making my stomach growl, Tara. I want one of these paninis right now! It looks fabulous and that’s a delicious flavour combo. Thanks so much Crystal for coming over! !